A portable GPS navigation system provides you with route guidance to your destination as well as local points of interest. Although smart phones and apps are becoming more popular, stand-alone portable navigation devices are still useful and have more features than ever before such as audible driving directions, verbal commands, real-time traffic with re-routing, and internet connectivity for points of interest. Some of the criteria we used to rate these personal navigation devices included ease of use, navigation/routing, display, user ratings, and price. 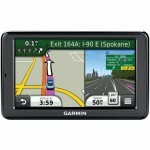 Below is our top 10 best GPS navigation systems reviewed. For additional information see our GPS Buying Guide. The Nuvi 3490LMT provides the most comprehensive navigation capabilities available with a 4.3″ clear and sensitive touch-screen display all packed into an ultra thin design. Some of the features included are Bluetooth connectivity, lane assistance, reality view, and superb voice recognition. The LMT version comes with free lifetime maps and traffic updates. It provides traffic updates through HD radio transmission, but it seems to have limited reception and weak signal strength. We highly recommend this model for all users at a price tag of around $250. 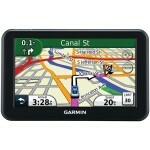 The Garmin Nuvi 3590LMT provides everything that the 3490 does, but it comes with a 5″ screen instead of a 4.3″. That one difference will set you back about $100 more. Unless you really want that 5 inch display, we recommend the Nuvi 3490LMT, since this model will cost you about $350. Rated as a Best Buy by a leading consumer magazine, the Garmin Nuvi 2555LMT ranks third on our list. 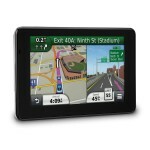 It comes with a 5-inch screen, reality view, lane assistance, and lifetime maps and traffic updates. On the downside it does not have Bluetooth connectivity or voice commands, and the traffic is ad supported. This unit is a really good value with a pricetag of about $175. 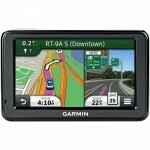 The Garmin Nuvi 50LM is the highest rated GPS navigation system on Amazon. It is a relatively simple unit, without a lot of advanced features. 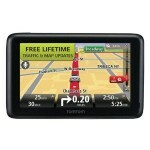 It has a 5-inch display with spoken street names, free lifetime maps, and over six million points of interest. The Garmin 2455LMT is virtually identical to the 2555 model (#3 on our list) except it has a 4.3-inch screen instead of a 5″ screen. That difference results in about a $25 savings. The TomTom GO Live 2535M features a 5″” screen with Bluetooth hands free calling, helpful destination routing, land assistance, and reality view. But what puts this unit over the top is its Live data service feature. It provides traffic updates, fuel prices, weather updates, travel apps like Yelp and TripAdvisor, and Twitter integration. Some people have complained that the Live features don’t work all that well, plus you have to subscribe to it after the initial trial period. It is also expensive at around $295. The TomTom GO 2435TM features include IQ routes, lane guidance, Bluetooth hands-free calling, and revamped voice-recognition software with a 4.3-inch screen. It does not have traffic updates or other Live features like the 2535M. It will set you back about $185. 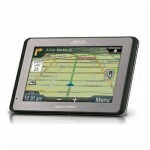 The Magellan RoadMate 5175T-LM Traveler has a 5-inch screen and features lifetime maps and traffic data. What makes it unique is its TourDirector feature which helps users plan vacations and explore attractions in unfamiliar cities. The Wi-Fi connectivity also allows it to browse the web and update its software. However the browser isn’t all that great because of the screen resolution and we wouldn’t use if for extended periods. This GPS unit provides decent value for its price of about $180. 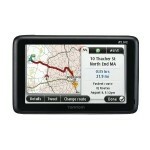 The TomTom GO Live 1535M is the first personal navigation device to integrate connected apps. It has Bluetooth and voice recognition along with a 5″” screen. Similar to the GO Live 2535M, this model also has traffic updates, weather, fuel prices, and apps like Yelp and Twitter. However the software seems clunky and slow. Among other differences between the two models include the mounting system which is not as good as the 2535 and the 2535 has an enhanced voice recognition control. It is available for less than $160. TomTom’s low cost VIA series option has a 5-inch color screen and similar to the GO Live 1535M except it does not have the Live features like real time traffic and apps. It does offer Bluetooth hands free calling and voice commands. The #10 option on our list of GPS navigation systems will set you back about $150. Most systems have screens ranging from 3.5 to 7 inches. The smaller models can be difficult to see when driving and have small buttons which can be a pain to use. On the other hand, the largest units when mounted to the windshield can block your view of the road. The 4.3-inch wide screens seem to be the sweet spot in between too small and too large. The larger 5-inch screens are becoming increasingly popular since they are easier to see and work well in bigger vehicles where the windshield is farther away. Look for a GPS that tells you to turn onto a street or highway by its name rather than just saying “”left turn ahead”” or similar general direction. Also called text-to-speech, this features helps you focus on driving, especially in busy and unfamiliar areas, instead of looking down at the navigation unit. All units come preloaded with maps. As roads change or maps improve you will want to update your model with the latest map available. If you don’t get a GPS system that comes with lifetime updates, you will have to pay for each individual update. In the long run this will cost more than just getting a unit that comes with lifetime map updates. In addition to maps, GPS units come with a preloaded database with points of interest like restaurants, gas stations, and stores to name a few. Some devices can search the web for POI if connected. The POI will vary from model to model so closely examine each models particulars in this area if it is important to you. Some models come with real-time traffic information that can alert you to a problem or slowdown ahead in time to avoid it. Some will even ask if you want to find another route and will detour you at the touch of a button. The real-time data is available to subscribers through a cell-phone network, FM signal, or satellite radio service. Many units have subscriber based traffic, while others offer free traffic information which is supported by banner ads that pop up on your screen. Many navigation systems offer different routing options including fastest time, shortest distance, avoid freeways, avoid toll roads, and even most fuel efficient route. With these features you can enter an address or city name faster. As you type, the predictive data entry will highlight the letters on the screen’s keyboard that will help complete a known name or place. The dynamic search will bring up a list of choices that complete the part of the text you have entered. This feature tells you the appropriate lane for the driver to travel in order to execute their upcoming maneuver. There are a variety of features that the newest GPS units have built in to make it easier to use and interact with them. Voice recognition means you can give the device spoken commands, leaving your hands free for driving. Some models also offer pinch and zoom controls like what you would commonly find on smart phones. Another handy feature is 3D view which lets you see any buildings, mountains or other landmarks in 3D. Most portable systems mount to the windshield using a large suction cup. We recommend an angled rigid arm to attach the unit to the suction cup. Note that some states have laws which restrict the placement of devices to the windshield. If you have a Bluetooth compatible phone, this allows you to make and receive telephone calls using the GPS system, and it automatically quiets directions while the call is being made.